Have you joined our Reseller Community? We want to develop an open relationship between us and our resellers. 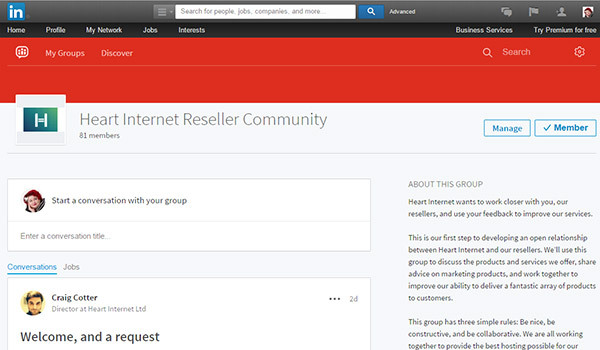 As part of this, we’ve just created a new Reseller community on LinkedIn. Through this community, we hope to discuss the products and services we offer, share advice on how to effectively promote and market products, and work together as a web host and resellers to improve our delivery of a fantastic array of products. We’re all working together to provide the best hosting possible for our customers, and through our Reseller Community, we hope to build a place where Resellers can talk to fellow resellers and us. Join the Heart Internet Reseller Community now. As part of making sure the group is a helpful and supportive place, we have a few short rules that all Heart Internet staff and resellers follow on the group. This seems easy enough, but it’s also the most important rule. Any behaviour, in any form, that is intended to cause physical and emotional harm will not be tolerated. Treat each other as you would expect and wish to be treated. The community focuses on positive change, and we ask that any feedback given in the group is constructive. Suggest possible solutions to problems raised or ask others to contribute. We want people to talk. Any self-promotional content, or anything that doesn’t make an effort to engage other members, will be removed. We hope you join our group and get involved in this community! Been a reseller for 10 years. The benefit is trying lots of stuff at no cost and adding unlimited demo material for potential new customers. Problem ticketing is 90% response 4 hours tops. I’m sorry to hear your support queries have had slow response times. I’m happy to say that the Heart Internet Customer Services team is up to full capacity, and you should see those response times drop dramatically in the coming months.